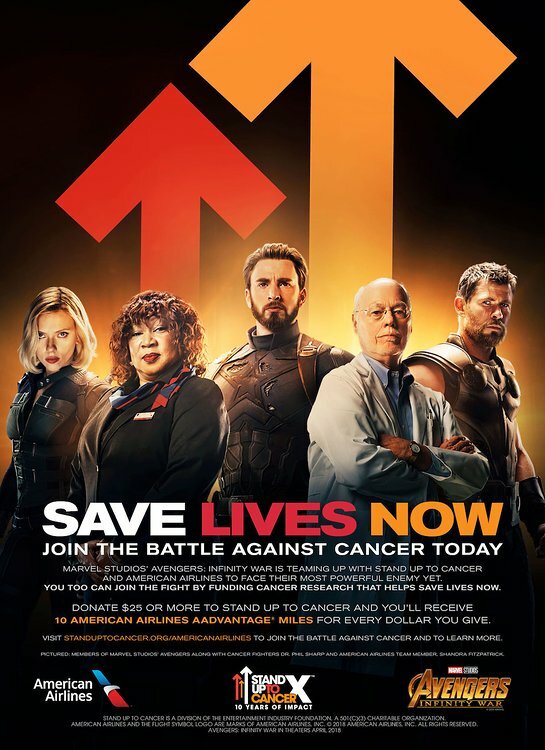 Today, Stand Up To Cancer (SU2C), American Airlines and Marvel Studios’ Avengers: Infinity War announced a powerful collaboration as they team up in the fight against cancer. The inspiring initiative and public service announcement (PSA) features beloved Marvel Studios’ Avengers: Infinity War heroes, esteemed SU2C researchers and American Airlines team members who have personally fought cancer. To raise funds, awareness and further Stand Up To Cancer’s mission to bring groundbreaking therapies and treatments to patients as quickly as possible, this first-of-its-kind collaboration comes to life in print, radio, digital and broadcast PSAs with a powerful call-to-action and additional campaign elements to come. The PSA campaign not only raises awareness for the cause, but also encourages American Airlines AAdvantage members to donate to Stand Up To Cancer. For every dollar donated, American Airlines AAdvantage members will receive 10 American Airlines AAdvantage miles with a minimum $25 donation. Learn more at StandUpToCancer.org/AmericanAirlines. 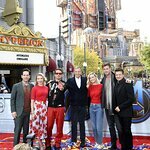 “With the magic of Marvel Studios, we’re proud to bring real heroes — our SU2C scientists and the American team members — together with fictional ones, to help save lives and enable our innovative work to soar to greater heights while empowering new audiences to join the movement,” said Stand Up To Cancer co-founder Sue Schwartz. Stand Up To Cancer researchers featured in the campaign include Chair of the SU2C Scientific Advisory Committee (SAC) Philip A. Sharp, Ph.D., Nobel Laureate, Institute Professor, MIT Koch Institute for Integrative Cancer Research, Massachusetts Institute of Technology; SU2C SAC Member Lee J. Helman, M.D., The Saban Research Institute and Children’s Center for Cancer and Blood Diseases at Children’s Hospital Los Angeles; Vinod P. Balachandran, M.D., Memorial Sloan Kettering Cancer Center, and principal investigator in the SU2C Convergence initiative; Marcela V. Maus, M.D., Ph.D., Massachusetts General Hospital Cancer Center and Harvard Medical School, an SU2C 2017 Innovative Research Grant recipient; and Kimberly Stegmaier, M.D., Dana-Farber Cancer Institute and Boston Children’s Hospital, a 2009 SU2C Innovative Research Grant recipient. Additionally, Poppy White, a 10-year-old patient who is currently being treated for leukemia at British Columbia Children’s Hospital and Research Institute, also joins the Marvel Studios heroes, AA Team Member cancer survivors, and SU2C researchers in the PSA campaign. The PSA campaign was developed and created by LA, a creative advertising agency located in Hollywood, CA. The broadcast PSA was directed by Tamra Davis, who recently directed episodes of Star, You’re the Worst and Younger. Please visit StandUpToCancer.org/AmericanAirlines to learn more about the campaign.